Need to keep a leg dry while you shower or bathe? Slide the glove onto your leg. Slip one bend over your leg and tighten into position by pressing the fastener together. Fold the loose end of the glove over the first strap. Position the second strap over the folded end of the glove and tighten. *You should read the directions carefully and practice putting the cast cover on correctly before submersing your leg in water. 1. Open the glove before putting on patient: insert your hand in body of glove to fluff open, gather small amount of air in glove, choke sleeve at end of glove and gently slide towards end to move air all the way into end of glove. 2. 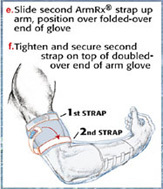 Full Length Gloves can be used for complete limb or partial limb protection: do not cut off the excess, it folds over and is secured by second strap. straps must be placed at top or bottom of muscle mass i.e. top or bottom of bicep or thigh muscle. 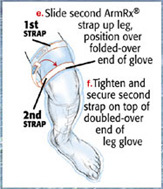 ArmRx® straps should be wrapped snug - since it is not elastic it will not continue constricting or becoming tighter. 4. 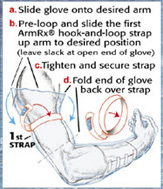 Small size band instructions: For small size limb application, wrap the extra ArmRx® strap length parallel (side by side) to the first strap exposing an entire bracelet of velcro to adhere to - can fit as low as 8” circumference. 5. Removal Of Glove: Dry the glove off after use. When removing the top strap (the one under the folded over excess glove) reach underneath the plastic and remove the Velcro strap first, then slide the glove off the limb. This will prevent excess water from dripping back onto the protected area.